This post is a collection of notes that I took as I was familiarizing myself with lifecycle management of Service Fabric applications. As I was going through the process I learned more about versioning and packaging, deployment and upgrade scenarios. Oh, and by the way I've found the official documentation pretty helpful. If you use a client certificate there are appropriate parameters allowing the cmdlet to look it up. -ServerCertThumbprint is used to verify if we are connecting to the correct cluster. The application package is created during the build process and is basically a directory structure containing an application manifest and service directories, each containing a service manifest and additional folders for code, config and data packages. As of SDK 2.5 release there is a new switch on Copy-ServiceFabricApplicationPackage cmdlet called -CompressPackage which enables in place compression of service packages and allows you to save bandwidth and time. The image store runs as a separate service inside your cluster (except for one box scenario). You have to provide a connection string to it which is by default configured as fabric:ImageStore. You should also provide a path in the image store to be used for this particular version of the package. You're going to need to specify this path later when registering an application type. You may want to come up with a convention where the path corresponds to the application package version. 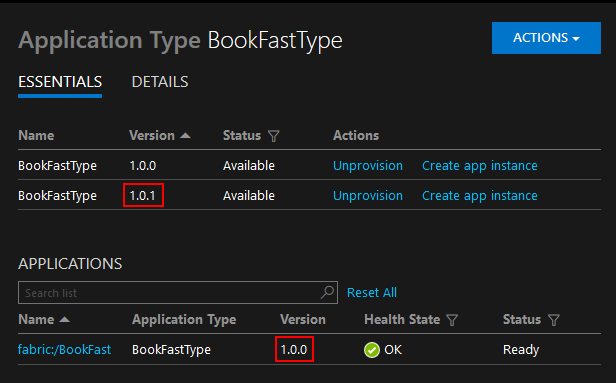 Once your package is in the image store it's time to register it as a separate version application type. Register-ServiceFabricApplicationType verifies the package and uploads it to the internal location. Only when the verification succeeds will you be able to create or upgrade applications with the new package. It may take longer than the default timeout of 60 seconds to register an application type of a large application. You can specify a timeout with -TimeoutSec parameter or you may choose to run the command asynchronously with Async flag. You can check the status of the asynchronous operation with Get-ServiceFabricApplicationType cmdlet. New-ServiceFabricApplication cmdlet creates an application of a registered application type. When an application is created all services defined as default services in the application manifest get created as well. Services can also be individually created as part of the specified running application with New-ServiceFabricService cmdlet. Service Fabric supports per environment configuration and we can pass a hashtable of environment specific parameters to New-ServiceFabricApplication cmdlet. In the example above we construct the hashtable by parsing the cloud environment parameters file which gets added by the default Visual Studio template. The actual parameters must be defined in the application manifest. I'd like to make a side note here that Visual Studio relies on a separate collection of PowerShell scripts when working with Service Fabric. These scripts can be found in 'c:\Program Files\Microsoft SDKs\Service Fabric\Tools\PSModule\ServiceFabricSDK' folder and are supposed to be used with Visual Studio tooling. There are script like Publish-NewServiceFabricApplication or Publish-UpgradedServiceFabricApplication that accept a per environment configuration file. Visual Studio even gives you a higher level universal script Deploy-FabricApplication.ps1 that supports publish profiles which are also added by the default solution template. These scripts provide a somewhat more convenient API from the tooling perspective. They ultimately rely on the Service Fabric PowerShell module. The new package should have appropriate service manifests and the application manifest versions updated. In other words, if you change any package of any service the affected services' manifests should reflect the new package versions and have their own manifest versions updated. 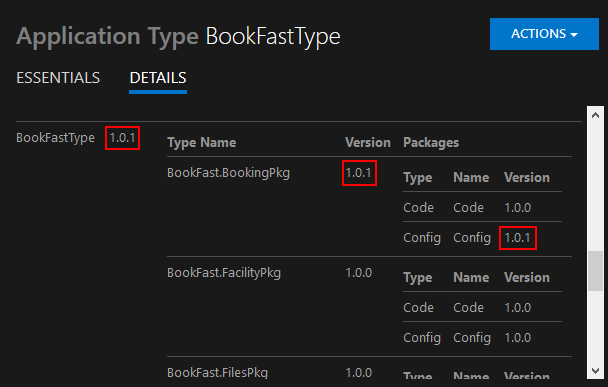 Register-ServiceFabricApplicationType : The content in CodePackage Name:Code and Version:1.0.0 in Service Manifest 'BookFast.BookingPkg' has changed, but the version number is the same. Even though I haven't touched the code package its binary content has changed. Thus I should either make sure to provide the same built artifacts for the unchanged packages or I can upload a diff package. A diff application package is the same directory structure as a full package however it only contains modified packages together with appropriate updated service manifests and the update application manifest. Any reference in the application manifest or service manifests that can't be found in the diff package is searched for in the image store. Register-ServiceFabricApplicationType : The Image Builder encountered an unexpected error. Hopefully it will be addressed soon. Now we're ready to start a monitored rolling upgrade of the application. Start-ServiceFabricApplicationUpgrade also allows you to provide a new set of environment specific parameters if needed. The upgrade is performed one upgrade domain at a time. Service Fabric performs health checks before moving to the next upgrade domain. We also chose to roll back to the previous version of the application if the upgrade fails at any point. Most of the upgrade parameters and timeouts are configurable. You can get more details on upgrade parameters here. Start-ServiceFabricApplicationUpgrade : Services must be explicitly deleted before removing their Service Types. In order to proceed with the upgrade you need to remove the running service with Remove-​Service​Fabric​Service cmdlet first.